Similar to the Christmas season, election campaigns also begin prematurely in the Philippines. There are still six months to go before the May 2019 midterm elections but campaign sorties are already in full-swing, the mainstream media have jumped on the bandwagon also. 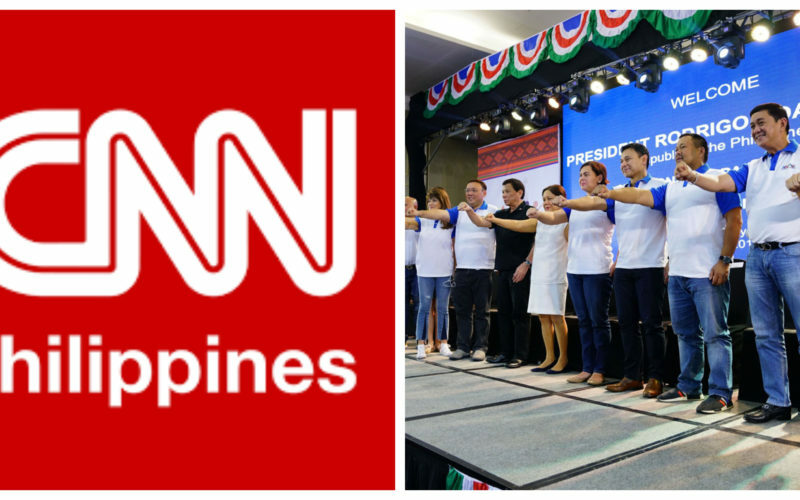 CNN Philippines hosted the first major event for Senatorial candidates this week, a forum with a live audience and featured eight potential members of the Upper House. In attendance were Congressman Gary Alejano, re-electionist Senators Bam Aquino and JV Ejercito, human rights lawyer Atty. Chel Diokno, Cabinet Secretary Francis Tolentino, retired police general Bato dela Rosa and former Senators Juan Ponce Enrile and Serge Osmeña III. Curiously, the hosts of the forum reiterated before the start of any questions that the event was a discussion panel rather than a debate. It was emphasized that candidates were not allowed to contest each other’s responses or to challenge their rivals, the jury is out whether it was an attempt to keep matters cordial or to prevent candidates from having their weaknesses exposed. The candidates were quizzed on contemporary issues such as the proposed shift to a federal form of government, Duterte’s infamous drug war and the maritime border dispute in the West Philippine Sea. Other issues such as traffic congestion, inflation and contractualization also featured prominently, and it was evident that each individual had a pet issue they were strongest at. Tuition-free state universities and colleges was fully implemented this year, and Sen. Bam Aquino referenced this in his contribution by stating that it leveled the playing field for all Filipinos. In addition, he also wanted improved linkage between the academic sector and various industries to streamline the job-seeking process for new graduates. Sec. Francis Tolentino wanted to introduce agricultural classes back to the education system, citing that it made sense given the Philippines is an agri-based country. He added that this was important to ensure the country’ agricultural sector persists, given that the number of farmers is dwindling. Former Sen. Enrile wanted a more holistic approach to education, which would require an overhaul of the current system and introducing a new version which would improve the ability of graduates to find employment or create livelihood opportunities. Unsurprisingly, on the subject of justice human rights lawyer Atty. Chel Diokno proved to be the strongest. As the former president of the Free Legal Assistance Group (FLAG), the son of a human rights icon shed light on an “unfair judicial system” that favours the wealthy and heavily disadvantages the poor. Diokno advocated for the strengthening of the Whistleblowers Protection Act which he says does not adequately protect witnesses of corruption and other crimes. He also mentioned the lack of lawyers in the country, which makes it difficult for destitute individuals to file complaints against injustices they suffered. It also came as no surprise that Gen. Bato dela Rosa advocated for tougher sanctions on criminals, particularly drug dealers and corrupt politicians. The former police chief pushed for the reinstatement of the death penalty, saying the country needed a “deterrent” against serious crimes. Another topical issue is that of political dynasties, where members of the same oligarchical family take hold of an area’s local-body politics for decades. As expected, Enrile – who has been in politics for decades and has also been followed by his other family members – had no problems with the phenomenon. The former Senator argued that if the people were to elect representation from the same family line, they should be able to. Tolentino, who is an ally of the Duterte family (a political dynasty themselves), also was favourable to political dynasties saying that it was “primordial in the Constitution that the sovereignty of the country lies with the people”. According to the one-time Senatorial candidate, if the people vote for members of a dynasty it should not be a problem. A key project of the Duterte administration is to transition the Philippines’ political system to a federal form of government. It is an initiative aggressively pushed by the President’s allies in politics, but one which has not found momentum in Congress. Former Sen. Serge Osmeña stated he is against the move to federalism, given that the regions are not self-sufficient at present and it would be difficult for them to survive if they were decentralized from the central government. This same sentiment was echoed by Cong. Gary Alejano, who also noted the perils of creating federal states that did not have the resources to become self-sufficient. Even re-electionist JV Ejercito, who is aligned with Duterte’s faction in the Senate, expressed his apprehensions with the move to federalism though he signaled he is open to supporting it. Photo taken from CNN Philippines. It was a given that the issue of the maritime disputes in the West Philippine Sea (WPS) would feature heavily during this election cycle, it is also unsurprising that the most vocal regarding this issue at the forum was Alejano who has made the topic his key campaign concern. He expressed his skepticism regarding a joint military exercise between the Philippines and China, while also opposed a joint-exploration agreement with the Asian giant to survey the area for oil. Enrile defended the proposal of a joint-exploration by comparing it to exploration permits the Government provides to the Shell Oil Company. Osmeña took a middle-ground approach, and stated he would be amenable to share resources with China only if the Philippines received the lion’s share. An issue that has taken the public eye is the arrival of thousands of workers from China who are employed in the country, particularly to construct Duterte’s Build-Build-Build infrastructure projects. Diokno expressed strong opposition to this arrangement, saying it was unfair to Filipino workers and that we should employ our own people first. His fellow Liberal Party candidate Bam Aquino also questioned the reason why these Chinese workers are in the country in the first place, saying there should be greater transparency in the Government’s BBB contracts awarded to Chinese firms. An audience member questioned candidates on how they will end the insurgency in the country. Ejercito rightly pointed out that poverty was a root cause for these rebellions. He advocated for poverty reduction measures to quell this conflict, saying if rural Filipinos had livelihood opportunities they won’t have a need to take up arms against the Government. President Duterte imposed martial law on Mindanao after the invasion of Marawi in 2017, there are moves to extend military rule over the area which has courted significant debate in Congress. Opposition candidates Aquino and Alejano both voiced their opposition to any extension of Martial Law, saying that there was no need for it given that the war is over. Even Enrile, who regularly aligns with the Government, said he did not see any reason to extend martial law. Tolentino, who is running with Duterte’s political party, said he would have to hear the justification to extend martial law before he can support it. The country’s capital suffers from debilitating traffic congestion problems that causes significant economic losses while also being a turn-off for potential investors and for tourists. Tolentino, the former head of the government agency tasked with improving traffic in Metro Manila, emphasized the need for urban planning and warned that without it the same traffic problems could happen in other high-growth cities like Cebu and Cagayan de Oro. Osmeña was critical of restrictive residential zones that hindered effective transport infrastructure planning, citing gated communities like Forbes Park which block major thoroughfares from being connected with each other. Enrile and Alejano both cited the need to spread economic development outside of Metro Manila, saying that there would be no effective measure against traffic congestion if the capital city kept on being developed and density further increased. Ejercito echoed the need for alternative transport methods, he referred to Manila’s lack of rail transit compared to the capital cities of other developing nations such as Kuala Lumpur or Bangkok. He advocated for the construction of more railway lines to ease vehicle usage. They say first impressions mean everything, and if that adage is proven true then Chel Diokno, Gary Alejano and JV Ejercito did well to kick-start their respective election campaigns. Diokno gave concise, clear answers that demonstrated his knowledge of issues regarding justice and criminal reform. JV Ejercito gave fresh, intriguing ideas on the country’s age-old problems such as traffic congestion and insurgency. Alejano provided decisive, firm answers to questions relating to the West Philippine Sea and martial law in Mindanao. He struck a balance between being a voice to the opposition and an innovator, not merely being a critic of the Government but also giving alternative ideas of his own. Juan Ponce Enrile and Serge Osmeña III both displayed their experience on the job, providing comprehensive answers that were evidently bolstered by their previous tenures as Senators. They portrayed themselves as elder statesmen who would be very competent on the job, but in many instances – particularly with Osmeña – they also showed their age when their delivery was sluggish. Francis Tolentino and Bam Aquino both displayed that they were capable of doing the job, with the latter frequently citing legislative pieces he wrote in his first term in office. Tolentino demonstrated that he could be an effective Senator himself, having been so close to winning a seat in the 2016 elections. He also drew inspiration from Duterte’s performance in the 2016 Presidential Debates when he would simply rehash the answers of fellow candidates he was allied with, such as Tolentino and Ejercito. 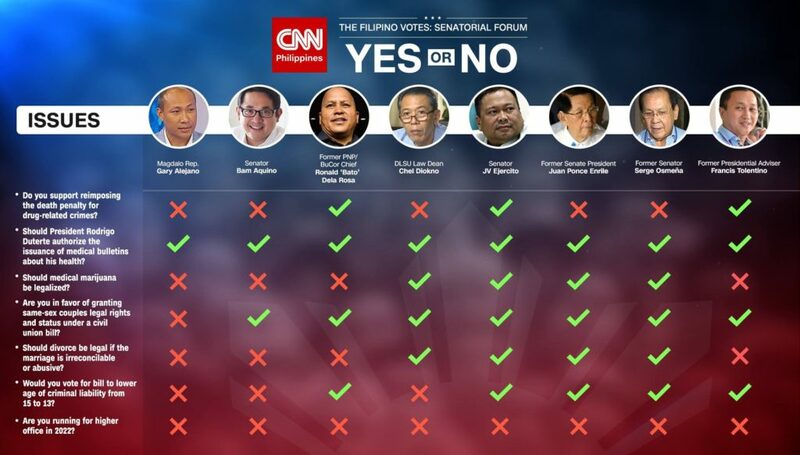 During a portion of the forum where the candidates would flash “Yes” or “No” if they were favourable to an issue being raised or not, Bato repeatedly changed his mind as if he did not understand the question himself and was merely trying to remember the Government’s position on the matter. The 2019 elections provides the Filipino population with an opportunity to express their disapproval over the rising prices of commodities, the escalating incursions in the West Philippine Sea and the never-ending traffic congestion problems that beleaguer their everyday lives. There is no time for comic relief or novelty candidates, and with the response Dela Rosa received from the live audience it was clear that the same sentiment is felt by others also. However, the first forum of the 2019 elections was promising given that candidates long-dismissed to have gotten into politics not by their own merits but by their familial ties such as JV Ejercito showed that they had the acumen to provide solutions to the country’s problems. Authentic and ingenious actions on education, the insurgency and criminal justice reform was also provided. Even the issue of providing ample public defenders, as raised by Chel Diokno, is not an issue that has received airtime by the mainstream media but yet it was advocated for in the forum. The platform provided by CNN Philippines was a mere glimpse of things to come, only eight candidates made their appearance and it would be interesting to hear from other prominent candidates such as Imee Marcos, Bong Go and Erin Tañada on what their viewpoints are.